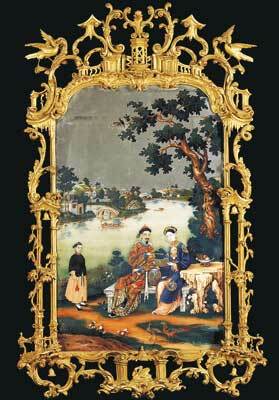 Carpentry was a highly respected activity among the artisan class of ancient China. Carpentry traditions there have existed for several thousand years, and have been noted in ancient texts. The Ode to Fine Grained Wood, quoted from here, was written in the 2nd-century BC. Here in the west we are fascinated by Oriental crafts. There seems to be an unconscious perception that Oriental objects are made using some mysterious and arcane skill unavailable to us but I believe the real difference is in approach. Woodworking prior to 1900 - and in remote areas a long time after 1900 - relied upon locally made hand tools, skill in using them, and the understanding of the timber based upon generations of experience. There was also a different perception of time. I am sure the Oriental woodworker's children were just as hungry as his Western counterpart, and that wages were a significant factor, but the complexity of Oriental joints and the makers' concern for aesthetic appearance is such that they cannot have been as concerned about time and output as their 19th-century Western counterparts. One of the reasons why joints were so complex in China, Japan and Korea was the climate. There are huge changes of temperature and humidity throughout the whole of central and south-east Asia, and many European colonists discovered the furniture they took with them from Europe fell to pieces because the animal glue softened in the high humidity and heat. 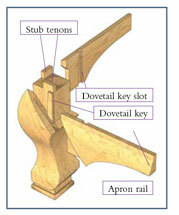 The woodworkers of those countries found that it was necessary to make interlocking joints which had mechanical strength rather than rely on glued joints. I recall the world-record price 18th-century mirror that I worked on at Sotheby's, pictured left, which had tiny bamboo dowels joining the 6mm-thick backboards rather than the European equivalent which would be a rubbed joint. This is not to say that oriental furniture was not glued; it just didn't rely so heavily upon glue. There is a similarity with 18th-century Continental chairs which tended to be pegged and glued as opposed to British ones which were only glued. 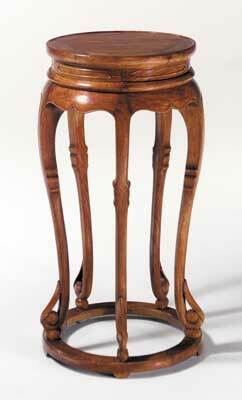 One could perhaps argue that Continental colonial furniture stood up to high humidity better than British furniture! One of the roles of the furniture restorer in China was to replace and tighten the dovetail wedges used when the joints in furniture had become loose. One needs to remember that the whole assemblage of a piece of Chinese furniture depends upon the interlocking joints for stability. The top is not glued up, followed by the legs being glued on etc. 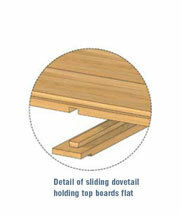 The frame holds the top boards, the legs then anchor the frame, and the dovetail wedges anchor the whole lot together. Christie's in New York recently had a specialist sale of Chinese furniture which they have kindly let me write about using their catalogue descriptions. 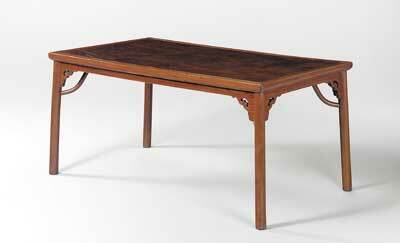 The first piece is a late Ming (16th/17th century) extended-leg table in huanghuali (Dalbergia odorifera). This is an unusual table in that it has more decoration than is usually found on Ming pieces. The top is made of two planks with a mitred frame, below which is an undulating lotus-leaf border. The rails are carved with phoenix, birds, flowers and cloud scrolls. The brackets are in the form of dragons. The bulbous feet are known as 'garlic head' feet. It is 865mm high x 535 x 647mm (34 x 21 x 25 1/2in). 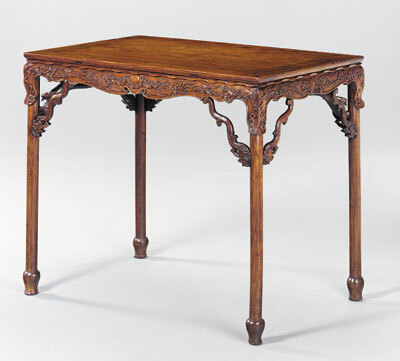 The term 'extended leg' refers to the fact that the early versions of these tables had a long leg extension that could be attached under the short stubby shoulder. This allowed the table to be used in wintertime low down on the heated floor, or in summertime raised up on its more elegant legs. These 'knockdown tables' were also easier to store. 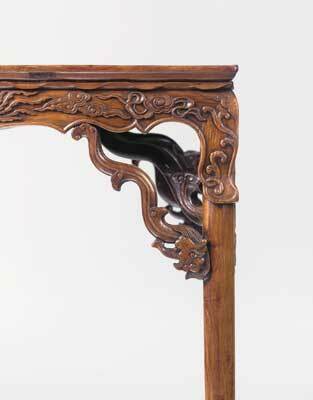 The detail of making these leg extensions is described in Klaas Ruitenbeek's Carpentry and Building in Late Imperial China. A Study of the Fifteenth-Century Carpenter's Manual Lu Ban jing (Brill Academic Publishers, ISBN 9004 105 298). Eventually two types of table were made. Those with short legs and those with (fixed) extended legs, as seen here. 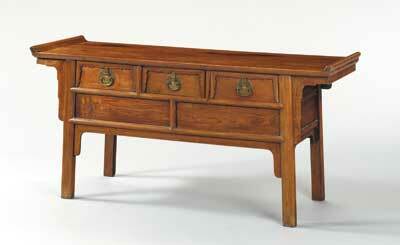 This much plainer late Ming table is also in huanghuali but this time the top is a panel of burr nanmu (Phoebe nanmu). It is 785mm high x 1755 x 940mm (31 x 69 x 37in). Chinese society was run by scholars. Some were civil servants while others were educated individuals known as 'literati', and this 'painting table' would act as a desk for official work and as a place for painting, calligraphy and writing poems. The spandrel brackets are in the form of stylised cloud collars, more usually seen on ceramics, and the braces securing the legs to the underside of the top are known as 'giant's arm braces'. The 'literati' furniture which forms a very large portion of the extant domestic output was characterised by the use of 'noble materials' and restrained proportion. In the West oak might be regarded as a 'noble' wood in the same way that a lion would be a 'noble' animal, whereas beech or chestnut would not be a 'noble material'. 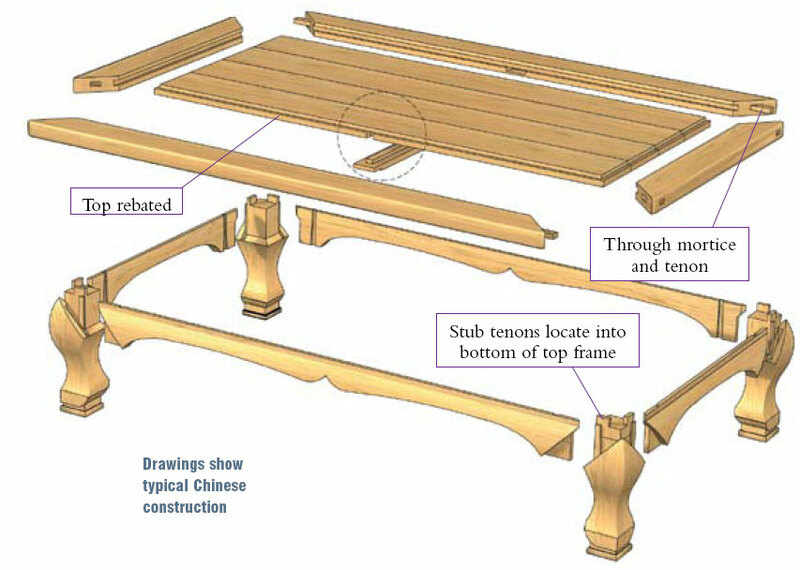 The density and working characteristics of the timber allowed the Chinese furniture makers to cut very intricate joints and use very slender leg sections which gave an appearance of purity. This characteristic, together with attractive appearance and elegant design, gave classical Chinese furniture its uniqueness. Unfortunately the hard timbers meant that chisels had to be sharpened more often - as anyone who has worked on Oriental furniture will confirm! Another major cultural reason why the Oriental craft ethos is so different from that in the West is that the Orientals respect the past. They venerate their ancestors and the objects associated with them. When a young member of a family inherits in the West the first thing they want to do is change everything and bring it up to date. In the East the objects and the traditions of the ancestors are maintained. There are in existence now, paintings from the Song dynasty (960-1279), which show tables very similar to the ones in the Christie's sale 900 years later. We simply do not have, and can barely understand, such a long, uninterrupted tradition of craftwork. Another item from the late 16th/early 17th century is this 610mm- (24in) high incense stand in huanghuali. This is a rather nice version of the conventional jardiniere stand. The top has a little bead around the edge, known as a 'water stopping bead'. The rim itself is formed of five segments above the panelled waist and the legs terminate in upward curling tendrils enclosing a sphere. These legs are rather similar to Art Nouveau designs. The cabriole leg, a French-derived term, was adopted by the West to describe the elegant curve of what the Chinese had long known as 'the elephant trunk', 'preying mantis' or 'dragonfly leg' form. The term 'altar coffer' is a Western invention. This is probably due to their inclusion in pictures showing them used as family altars. They were also used for domestic storage. Any narrow side table could be used as a family altar, as indeed could a plain shelf. In fact what is a table other than a shelf set on legs? The piece shown here, again in huanghuali, is 815mm high x 1805 x 560mm (32 x 71 x 22in) and has the familiar swing handles in brass normally associated with Chinese furniture. The plane was introduced in China in the 18th century. The effect of this straight edge-producing technology can be seen in the subtle shift towards angularity and straight-line moulded profiles that became characteristic of 18th-century items. 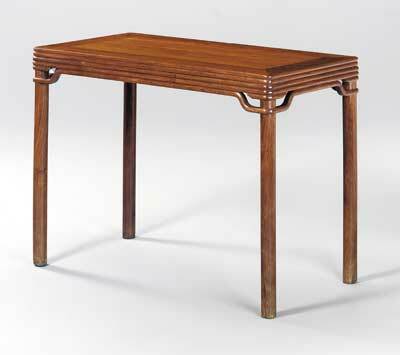 An 18th-century huanghuali bamboo-style corner-leg table, 815mm high x 1120 x 560mm (32 x 44 x 22in) is shown above right. The reeding around the top is intended to look like applied bamboo canes. Sometimes the nodes are carved but in this instance stylised bamboo has been used in order to retain the symmetry. These legs run straight down from the underside of the mitred top frame as opposed to the extended leg version seen earlier. "There seems to be an unconscious perception that Oriental objects are made using some mysterious and arcane skill"